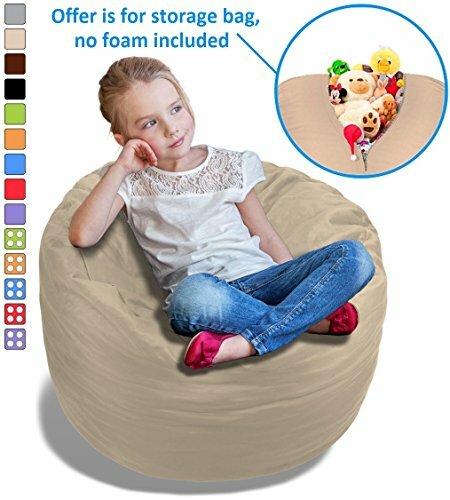 1 x BeanBob Stuffed Animal Storage Bag in Sand Dune. Make tidying up fun and easy with this excellent solution for storing away all those soft toys, blankets, and clothes while also doubling up as a fun and stylish bean bag. Made of strong, durable and soft fabric which can withstand the rough and tumble day-to-day use of being regularly sat on, opened and closed. Washing machine friendly, for the likely case of any accidental stains or mishaps! Features an easy to carry handle to allow small kids to use the storage bag all over the house, without leaving a trail of destruction behind! Measures up to 30" W x 30" D x 24" H with a floor space of 42" x 42" required, when fully loaded. Unlike smaller storage bags, the BeanBob holds up to 100 soft and fluffy toys, making it the ideal option for young children. This fun and practical gift is perfect for any birthday or holiday occasion, with a huge range of different colors and designs available to match any child's bedroom design. EASY STORAGE: 1 x BeanBob Stuffed Animal Storage Bag in Sand Dune. Make tidying up fun and easy with this excellent solution for storing away all those soft toys, blankets, and clothes while also doubling up as a fun and stylish bean bag. ONLY COVER INCLUDED, NO BEAN BAG FILLING. HIGH QUALITY: Made of strong, durable and soft fabric which can withstand the rough and tumble day-to-day use of being regularly sat on, opened and closed. Washing machine friendly, for the likely case of any accidental stains or mishaps! CHILD FRIENDLY DESIGN: Features an easy to carry handle to allow small kids to use the storage bag all over the house, without leaving a trail of destruction behind! Measures up to 30" W x 30" D x 24" H with a floor space of 42" x 42" required, when fully loaded. HUGE CAPACITY: Unlike smaller storage bags, the BeanBob holds up to 100 soft and fluffy toys, making it the ideal option for young children. PERFECT GIFT: This fun and practical gift is perfect for any birthday or holiday occasion, with a huge range of different colors and designs available to match any child's bedroom design. If you have any questions about this product by BeanBob, contact us by completing and submitting the form below. If you are looking for a specif part number, please include it with your message.